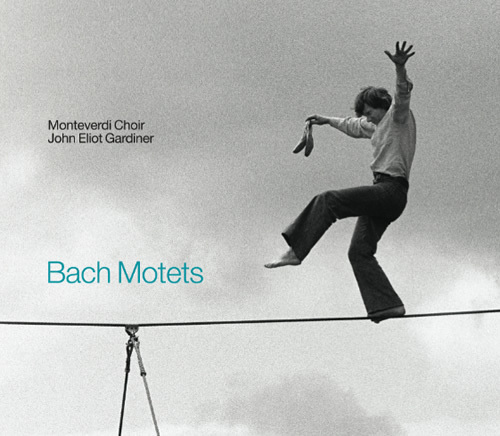 The Bach Motets may be easy on the ear but they're a tough sing. That's the point John Eliot Gardiner is making with the image of high wire artist Philippe Petit on the cover of this disc. We will have to take his word though, because the Monteverdi Choir make them sound like child's play. The choir's repertoire covers an increasingly broad range of Renaissance and Baroque music, but few other works demonstrate its exceptional talents as vibrantly and concisely as this series of miniature masterpieces. Instrumental playing and vocal solos are kept to a minimum here, but there is no shortage of variety in the choral writing. Nor indeed in the choral singing, and although the performance stays well within Gardiner's historically-informed stylistic boundaries, the subtle gradations of tempo, dynamic and timbre ensure continuous variety and interest across the disc's generous 70 minute span. The album is taken from live recordings made at St John's Smith Square in October 2011. Gardiner and his choir have recorded in dozens, even hundreds, of fine church acoustics, so they know what they are looking for. Even though Gardiner fields a large choir for the Bach Motets, the relatively dry acoustic of St John's turns out to be ideal. There is atmosphere aplenty, but the detail of the sound is clearly a more important concern for the performers. Delicacy and precision characterise the choral singing in every track. The balance between the voice groups allows every detail of the counterpoint to shine through. The basses sometimes sound a little weak, although support from the continuo group (cello, double bass, bassoon, organ) ensures the balance is retained. In fact, the discretion of this support is one of the many wonders on the disc. Listen, for example, to the opening of Der Geist hilft unser Schwachheit auf, where the chamber organ makes its presence felt, but using registers so close to the human voice that it quickly blends into the choral sound and disappears. The singers give a real questing quality to all the counterpoint, as if they are exploring these intricate textures for the first time. Their approach to the homophonic textures is just as sophisticated. So, in Furchte dich nicht, ich bin bei dir, the chordal setting is presented with impressive dynamic gradation, building up the volume across the movement, but also creating subtleties of shading and nuance between each of the individual phrases. The size of the choir means that emphasis, when required, can be placed using only the weight of the sound, without recourse to heavy accents. That is a particular benefit in 'So nun der Geist des' from Jesu, meine Freunde, where the music itself is considerably more elegant than the consonant-heavy text. Not that the words are overlooked, rather each line is presented with clarity and emotion, but without ever a hint of sentimentality. The cover has occasioned some controversy, but few could complain about what is to be found within. The disc comes in a hardback booklet style case, which includes the texts, facsimile pages from the autograph score and an insightful eight-page essay from Gardiner himself. An impressive package all round then, and one that deserves the highest recommendation. Not that any is necessary given Gardiner's reputation when it comes to Bach.